Sunday was a great success. 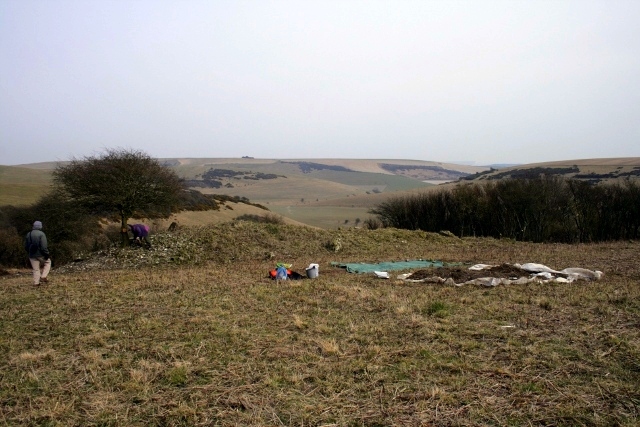 Eight volunteers turned up, including 3 from Brighton & Hove Archaeological Society and their ‘battle wagon’ full of useful tools. The day was sunny and almost warm! The ground was moist but dried once exposed to the drying sunshine. Digging W side of Cottage. 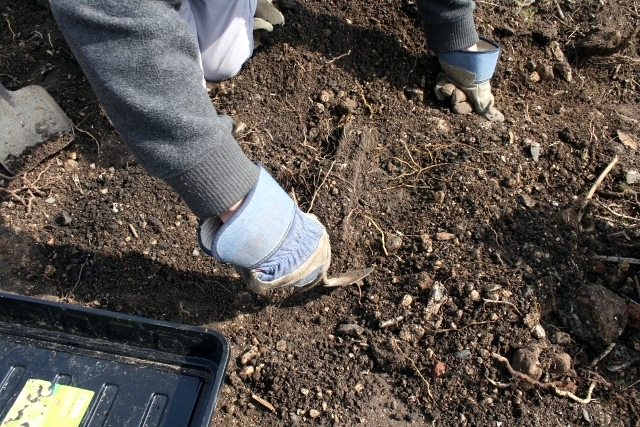 A digging hoe was used to cut through the bramble and nettle roots and did the job very well. 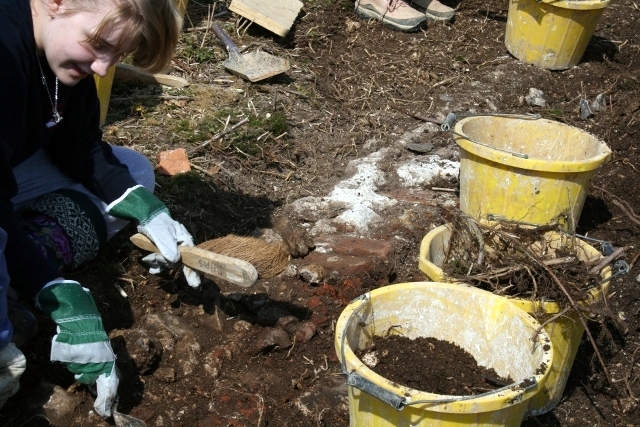 An old tarpaulin was used to contain the spoil, so that it would be easier to shovel it all back at the end of the dig. 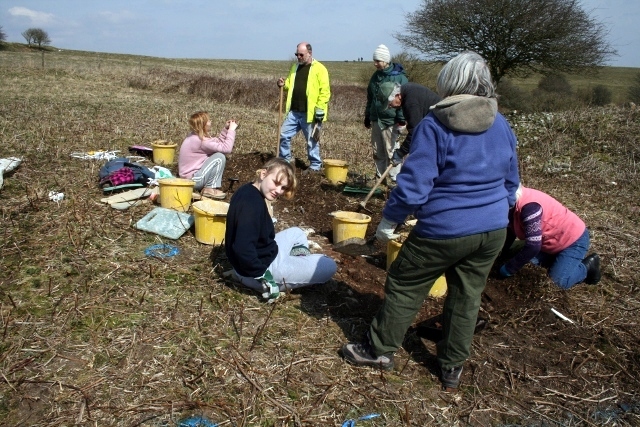 The trenches need to be backfilled when we are finished to protect the archaeology from the elements. Uncovering the W wall of the house. I erroneously thought we were digging the SW corner of the house. I now know we were in the middle of the house, and soon came down on the partition wall dividing the two downstairs rooms. Junction of internal wall with external house wall. The partition wall exposed was a single course of a half brick, otherwise known as single leaf, stretcher bonded construction (see Wikipedia page on ‘brickwork‘). 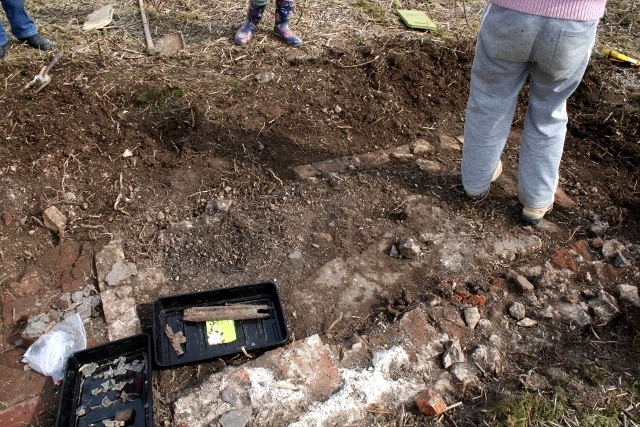 To its south a mortared floor was uncovered. Overlying it was a very dark coloured soil with both a number of rusted iron objects and small fragments of coal. This has been labelled as trench 1A. Some iron finds from trench 1A. 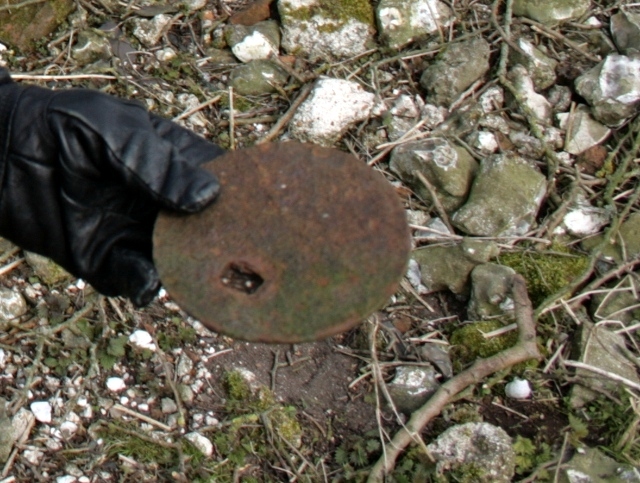 Iron object from trench 1A. 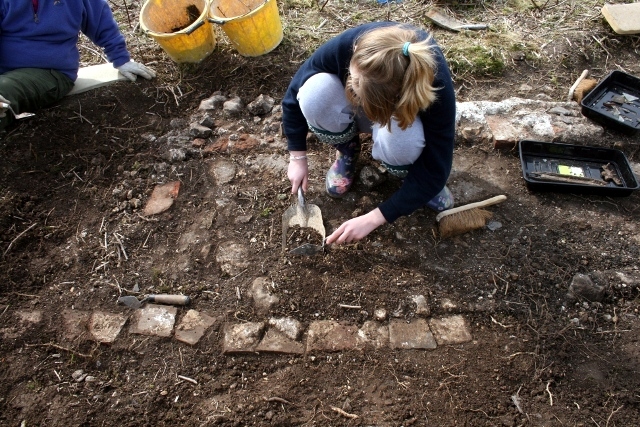 Trench 1A showing un-mortared bricks edging its E side and exterior wall to its W.
Trench 1A showing un-mortared bricks on E edge. Composite photo of Trench 1A. This feature, now known to be within the building, may have been an indoor store for coal, in what used to be the kitchen. In Victorian times all cooking would probably have been over an open fire. With little or no wood available over the downs, relatively cheap coal delivered by rail would have been their main source of fuel. Therefore this feature may post-date the original construction of the house by more than a decade. To understand this feature in greater detail, surviving former occupants need to be questioned if they remember such a coal store. Also desk-based research on the local rail transport of coal and its domestic use in the area may prove useful. 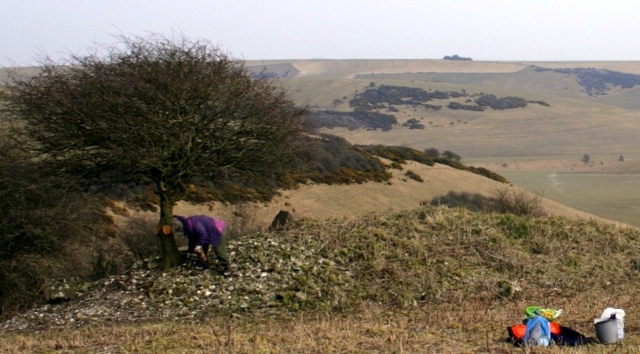 Further excavation may reveal details of its stratigraphy. 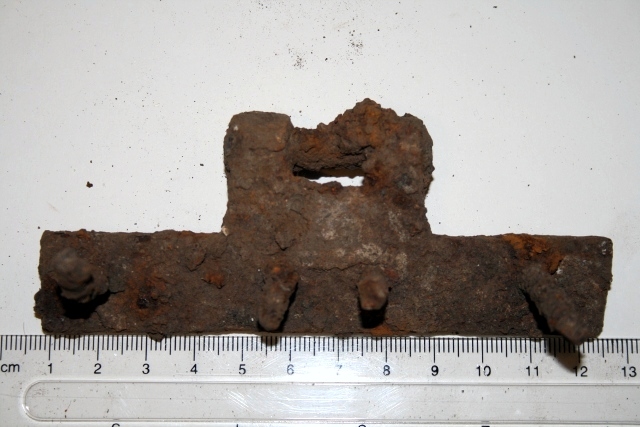 Iron hinge from trench 1A. 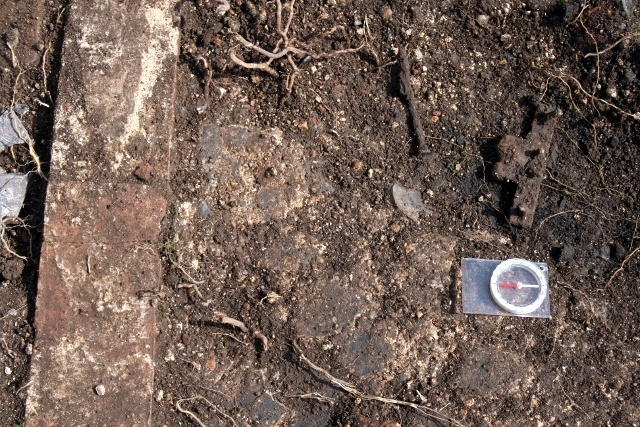 The finds from trench 1A included a rusty iron hinge, possibly from a door to this probable coal store. 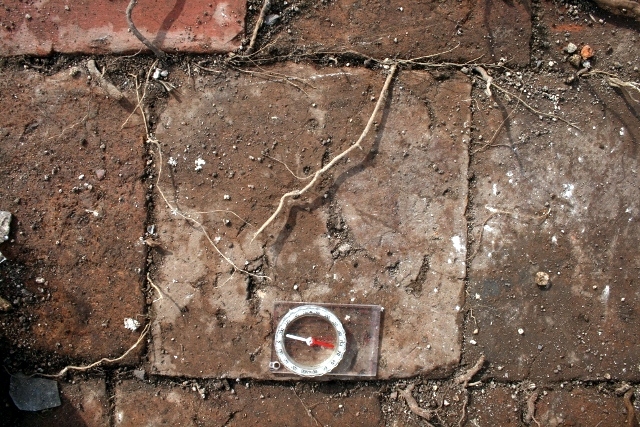 To the north of this feature a floor surface was revealed of very nice, roughly 23cm square, terracotta tiles. 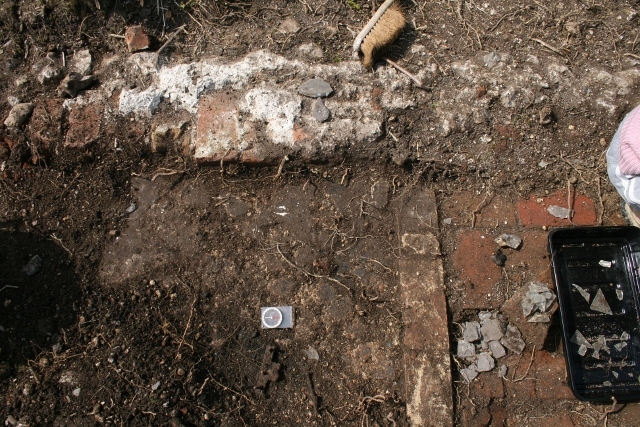 Terracotta tiles in trench 1B, a possible pantry. 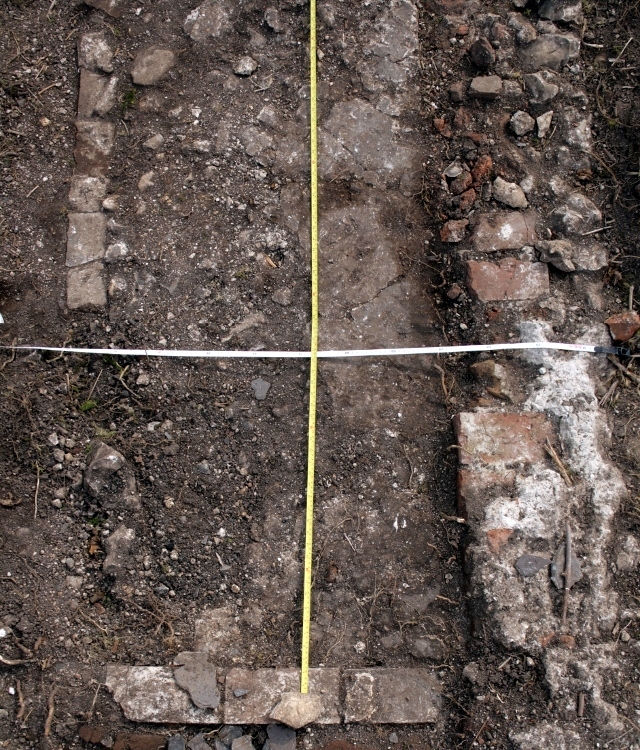 From on top of this floor, some in-situ mortared bricks were found; almost certainly collapsed wall from shell damage during the second world war (October 1942 when the house was requisitioned – 1945). 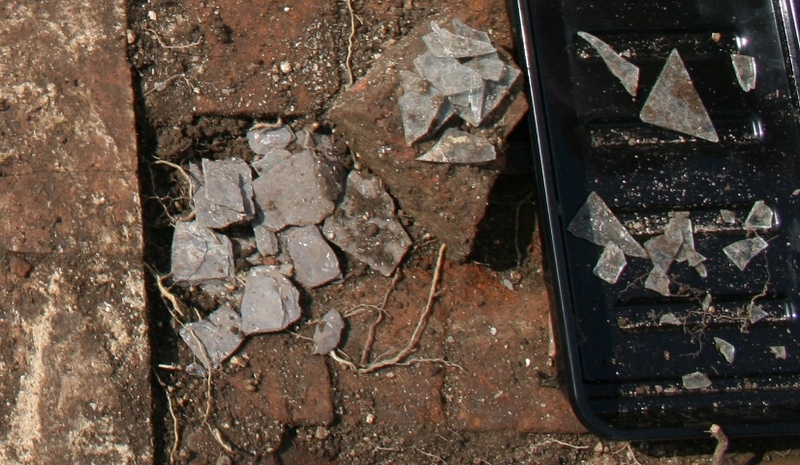 Window glass and slate finds from trench 1B. In with this was a quantity of relatively modern looking window glass – indicating the pantry may have had a window overlooking the farmyard to its west. Also present was a quantity of blue slate tile, presumably from the roof. Lucite(?) 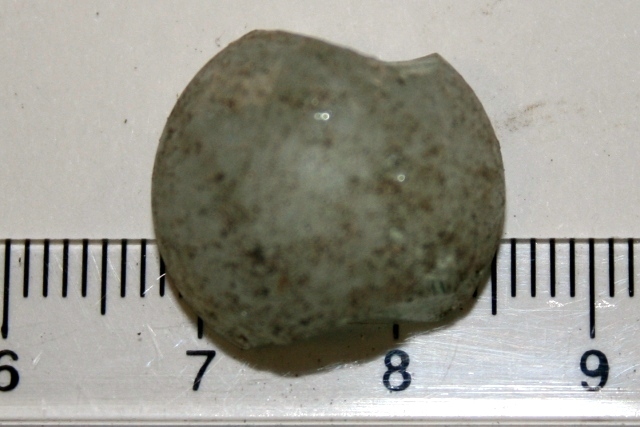 bead from floor of trench 1B. Lucite(?) bead, on floor of trench 1B. 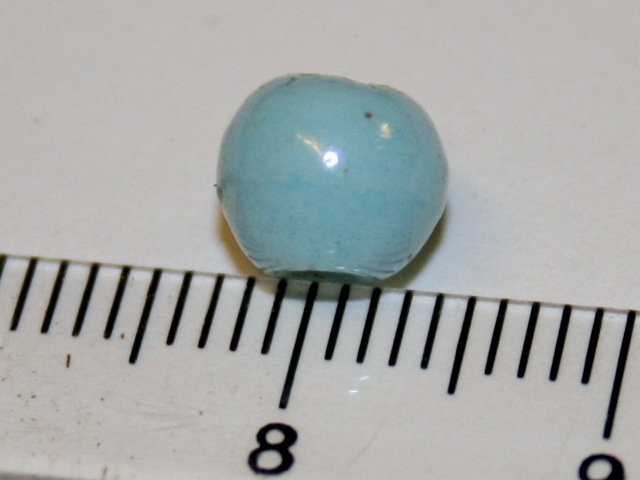 This small bead may be a very exciting find. It appears to be made of plastic. The earliest plastic beads were made from bakelite, but the colour range was very limited. The colour of this bead is too bright for bakelite. The next succesful type of plastic used for jewelry was an acrylic thermoplastic, which appeared under the trade name of Lucite. It was first used as an articificial glass under the name of Plexiglass in 1933, and has also been marketed under many different names such as ACRYLITE®, and Perspex. Because it did not shatter it was heavily used during WW2 for airplane windshields, canopies, and gun turrets. After the 2nd World War, many companies produced Lucite jewelry, but before this only the high end costume jeweller Trifari used it. Their costume jewlery was considered ‘a stylish and affordable‘ alternative to wearing precious gems and metals. However, this American company made a number of patriotic pieces in support of the war effort, including gaining exclusive rights to using the British RAF emblem. There is the possibility that an army officer was billeted with the Latham family, before they were forced to leave in about October 1942. 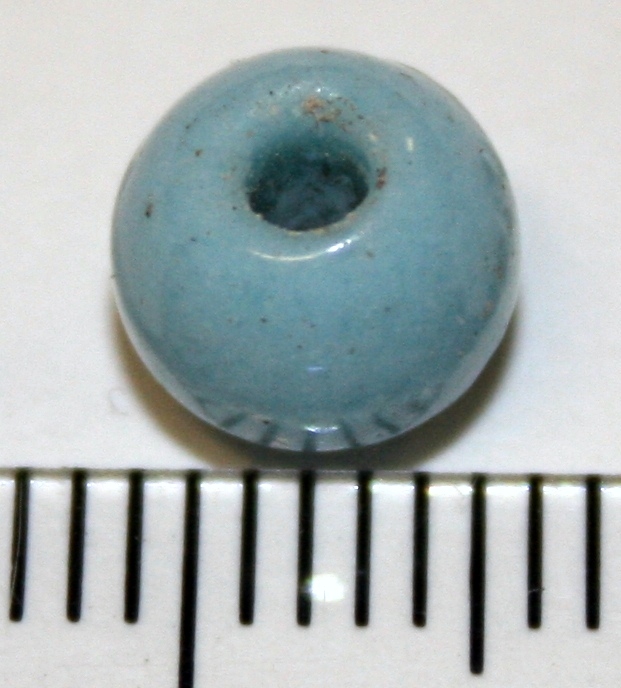 Could this bead have been part of a gift to Peggy’s mother? The Latham family, like all their predecessors in Newmarket Cottage, were poor and could not have afforded to buy it themselves. 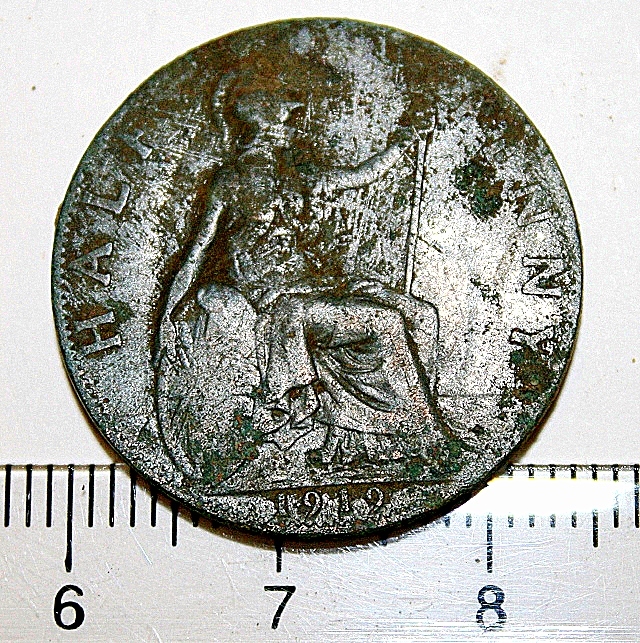 1919 halfpenny from trench 1B. This 1919 halfpenny, badly corroded on its reverse, would have been worth about 30p today. It may have belonged to the Moon family who lived there at the time of the 1911 census. 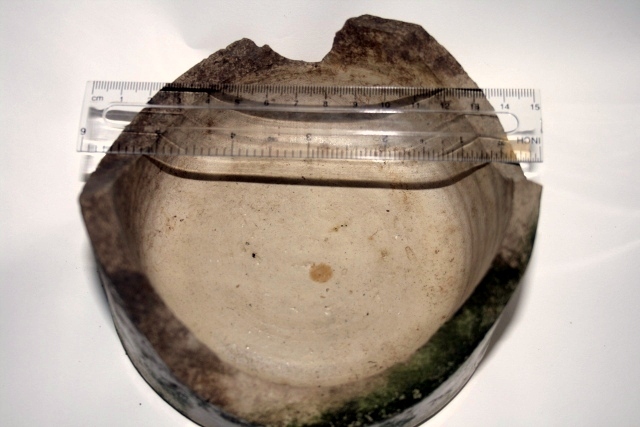 Stoneware jar base, from rubble mound. 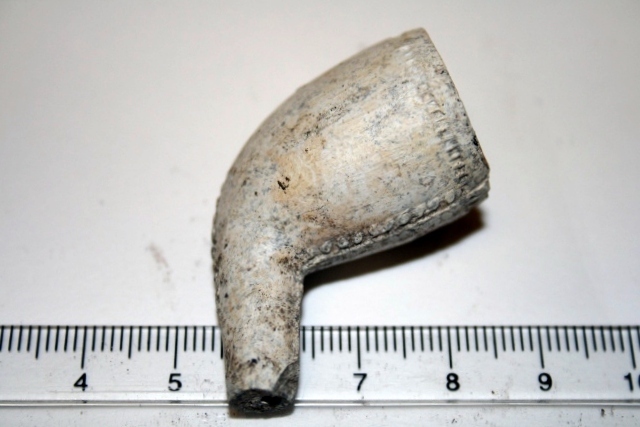 Decorated clay pipe bowl, 19th c.(?) from rubble mound. 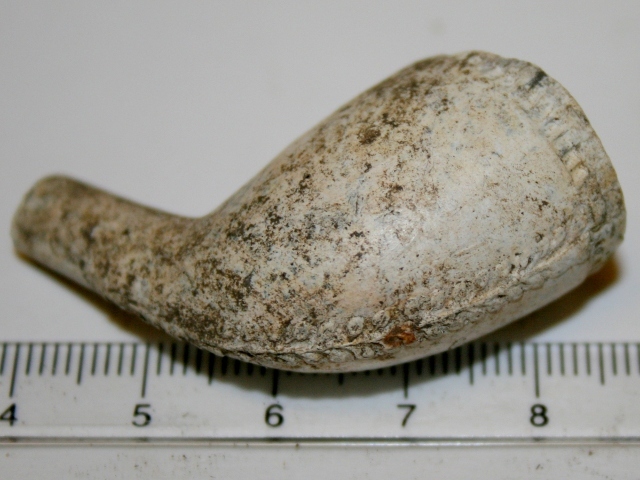 Another view of decorated clay pipe bowl, 19th c.(?) from rubble mound. This pipe is almost certainly 19th c. because of the angle of the bowl relative to the stem, and the evenness of the moulding and finish. 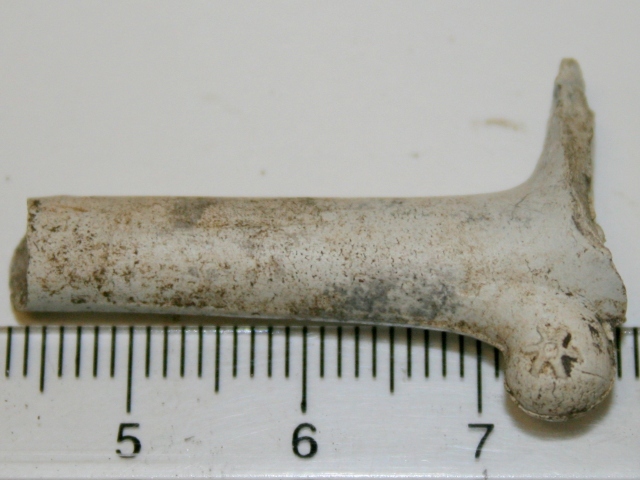 Clay pipe stem with a star shaped makers mark on heel, 19th c.(?) from rubble mound. 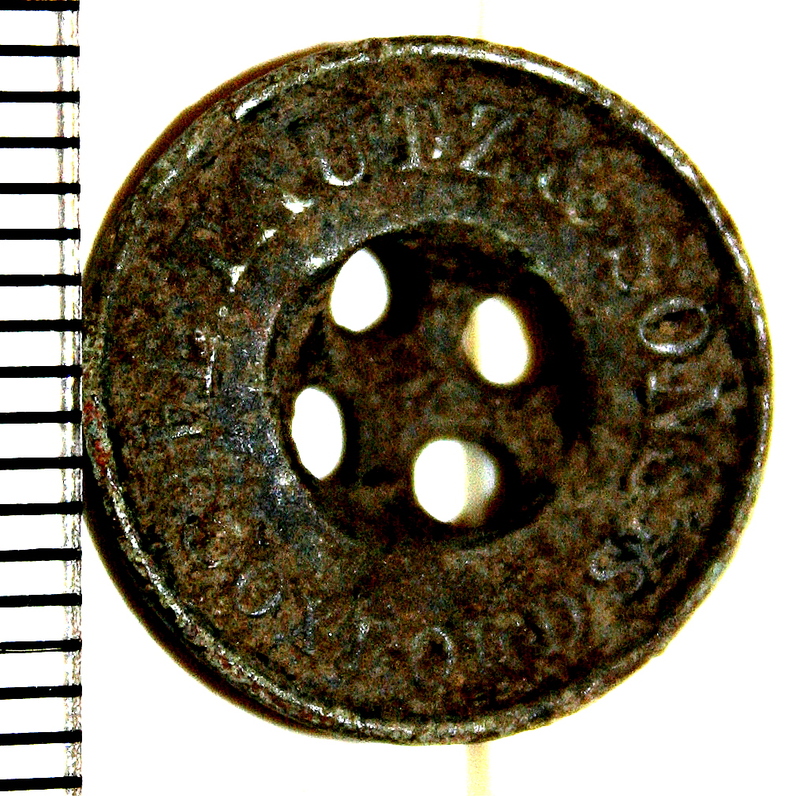 Tautz button from surface of rubble mound. E. Tautz & Sons were high class makers of riding breeches and other related clothing for “the hunting-field and military men“, occupying this address (opposite Selfridges) from shortly after 1867 till sometime before WW2. There was much hunting and military activity over Newmarket Hill. Was this a button lost by a gentleman out riding, and found by one of the many children who lived in Newmarket Cottage, or was it a hand-me-down from the well meaning wife of such a gentleman? Poverty with agricultural labourers was extreme. Occassionally there were those, such as the lodger in Newmarket Cottge in 1868, Martin Brown, who “acquired” the money to be able to buy quality garments that others in his situation would not have been able to afford. Half a broken marble from a Codd Bottle, from the surface of the rubble mound. Codd-neck bottles of fizzy pop contained a marble in their neck. The pressure of its carbonated contents pushed it against a washer which produced a gas-tight seal. Needless to say, despite the deposit on the bottle, kids liked to smash them open to get at the marble inside. This one may have been from a stolen empty bottle. They date from 1873 till the 1930’s when they started going out of fashion for the more modern screw-top bottles introduced in the 1920’s. 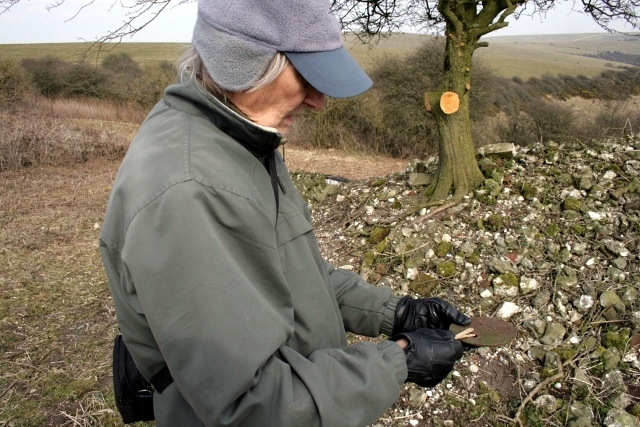 I returned with my parents the next day to record the trenches in a little more detail, and to cover them with a tarpaulin to protect them from the rain. Looking SE from NW corner of Farmyard at bulldozed mound of demolition rubble. North end of rubble mound. My Dad found the lid to a cast iron stove on the north end of the rubble mound. What might the stove have been like? To which family did it belong?